Today I have another NOTD (nail of the day) post for you, today's polish is a lovely summer coral/pink shade from the brand NYC and up until recently I had never tried NYC until one of my lovely friends Gemma introduced me to their polishes when we were chatting about nail polish one day, since then I have tried quite a few of their shine in a minute polishes but when Gemma told me about their gel gloss range I knew I had to pick them up. I used to have gel manicures quite a lot but they started to have an effect on my nails and my nails became brittle and would break very easily so I stopped having them, but I do miss the effect I got from a gel manicure especially that gorgeous high gloss finish. 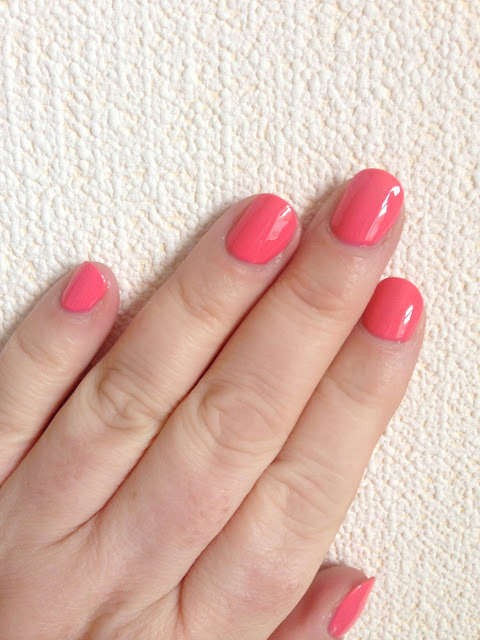 I purchased a couple of shades from the gel gloss range and the one I am sharing with you today is Harlem Figure a lovely coral/pink shade and one that is perfect for the summer. I used 3 coats of the NYC polish allowing each to dry fully in between and then I used my beloved holy grail top coat the Orly Glosser and I loved the finished look. 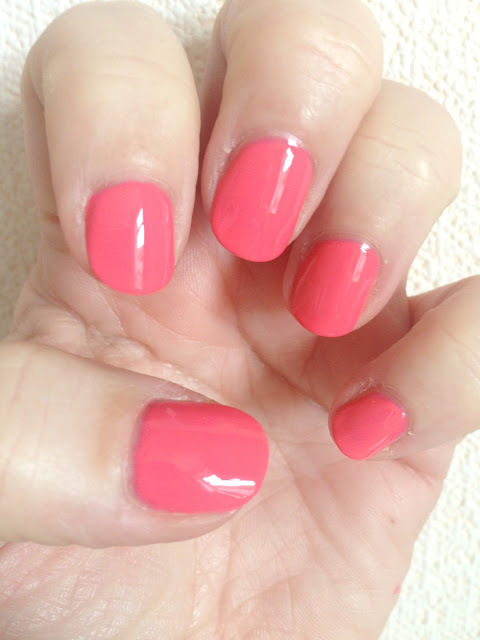 I adore coral and pink shades for the summer months and Harlem Figure is a perfect mix of both it really is a beautiful shade. I'm not sure I could go as far as saying my nails look like I've had a gel manicure but they do look lovely and glossy and I always receive a lot of compliments when I wear Harlem Figure, the polish lasts for 4 - 7 days on my nails depending if I catch them or not, I have a habit of catching my nails when opening things and chipping a corner but if I don't do that I can wear the polish for a week and considering the price of £2.49 I think that is amazing! I would highly recommend the NYC gel polishes they come in a range of lovely colours, they give a lovely high gloss finish and the wear time is brilliant for such an affordable polish, I need 3 coats of the gel gloss polishes I think because of the gel like formula the first coat can look a little streaky but allowing each coat to dry fully in-between and using 3 coats gives me a gorgeous opaque finish with a high gloss shine, these gel finish polishes definitely give some of the more expensive polishes on the market a run for their money and I will certainly be purchasing some more shades from the range. If you would like to try Harlem Figure you can find it at Superdrug for £2.49 here or if you want to check out the other shades in the gel gloss range you can find them here. 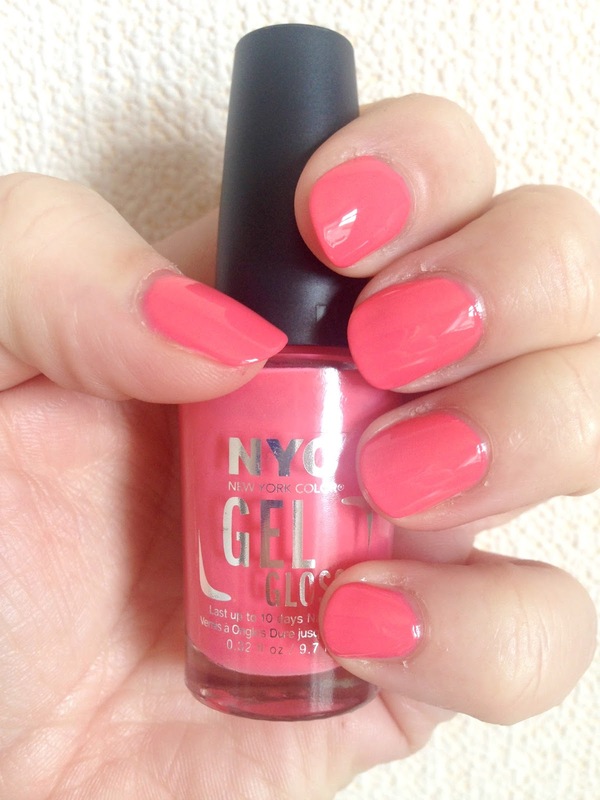 Have you tried the NYC gel gloss polishes? Which one is your favourite?